Collaborative hydraulics, targeted pavement preservation treatments, cost-effective pedestrian safety strategies and weather-savvy roads are among the 11 innovations in the fourth round of the Every Day Counts initiative. In 2017 and 2018, Federal Highway Administration innovation deployment teams will work with highway agencies and their transportation partners to deploy the EDC-4 technologies and practices they choose to try in their states. “Through the six years of our EDC partnership, we’ve brought new innovations to the forefront to deliver projects more quickly, improve safety, reduce congestion and improve environmental sustainability,” said Federal Highway Administrator Gregory Nadeau. Transportation leaders will meet at seven regional summits this fall to learn about the EDC-4 innovations. Summits are set for October in Baltimore, Maryland; and Bloomington, Minnesota; November in Albany, New York; and Sacramento, California; and December in Portland, Oregon; Austin, Texas; and Orlando, Florida. FHWA’s call for ideas for EDC-4 drew a strong response from stakeholders, who offered more than 130 suggestions and comments. “After extensive consultation with the American Association of State Highway and Transportation Officials, our agency partners and other industry stakeholders, 11 were selected to be promoted under EDC-4,” Nadeau said. The launch of EDC-4 coincides with completion of the national network of State Transportation Innovation Councils, collaborative groups in every state that lead innovation deployment. “This network forms the foundation for an innovation culture in the transportation community, a key to continuing our progress in advancing innovation,” said Nadeau. After the EDC-4 summits, STICs will evaluate the EDC-4 innovations and decide which to implement in 2017 and 2018. As in past EDC rounds, FHWA teams will provide technical assistance and training to help the transportation community adopt the EDC-4 innovations. FHWA will also offer deployment assistance and incentives through its STIC Incentive and Accelerated Innovation Deployment Demonstration programs. Accelerating traffic incident management data collection promotes use of low-cost, off-the-shelf technologies that streamline data collection so programs to clear crashes safely and quickly can be measured and improved. Automated traffic signal performance measures can revolutionize traffic signal management by providing the high-resolution data necessary to actively manage performance, improving safety and customer service while reducing congestion and costs. The collaborative hydraulics: advancing to the next generation of engineering effort improves on current modeling techniques used for hydraulic design by more accurately depicting physical, environmental and habitat characteristics through 3D visualization of flow, velocity and depth. Community connections techniques help planners support revitalization efforts by seamlessly integrating transportation facilities into their community settings and developing designs that best suit the purpose and needs of individual communities. Data-driven safety analysis, also an EDC-3 innovation, uses cutting-edge software to analyze crash and roadway data and determine the expected safety performance of highway projects more reliably, resulting in fewer and less severe crashes. The e-Construction and partnering: a vision for the future effort encourages highway agencies to use paperless technologies to enhance partnering among project teams, improving communication and workflow and streamlining project delivery. e-Construction is also part of EDC-3. Integrating National Environmental Policy Act and permitting processes promotes concurrent, synchronized environmental and permitting reviews, saving time and money on construction projects. Pavement preservation (when, where and how) can extend the service life of a pavement system by applying a preservation treatment at the right time on the right project with quality materials and construction. This innovation includes treatments and construction methods to achieve and sustain a state of good road repair despite tight budgets. Road weather management—weather-savvy roads promotes the use of Pathfinder strategies to provide consistent messaging to travelers on adverse weather and road conditions and advanced vehicle-based technologies to enable agencies to manage the transportation system proactively, before negative weather impacts occur. Safe transportation for every pedestrian—STEP—strategies use cost-effective countermeasures to cut pedestrian fatalities, which account for 15 percent of road fatalities, at uncontrolled crossing locations or intersections with no traffic signal or stop sign. Use of ultra-high performance connections for prefabricated bridge elements and systems, also an EDC-3 innovation, creates a simple, strong and durable connection that allows accelerated, cost-efficient construction of bridges. Which locations on a roadway system should receive safety improvements? How many crashes are too many for a given site? Is my agency making the best highway safety investments? Transportation professionals have struggled with these questions for decades. Now many states are answering them using an approach called data-driven safety analysis. DDSA is the application of the latest generation of crash and roadway analysis software. Recent advancements with these tools make it possible to quantify the expected safety impacts of design choices. By quantifying safety, agencies can make more informed investment decisions. This allows them to identify the best sites for improvement and target limited dollars to the most beneficial locations. The result is safer roads. The Federal Highway Administration is promoting wider use of DDSA in Every Day Counts round three. The effort has been so successful that DDSA will continue as an EDC-4 innovation. Eight states have made DDSA standard practice in their project development processes, while 13 have institutionalized DDSA in their safety management processes. Another 28 states and Washington, D.C., are applying DDSA in project development and safety management. DDSA has two approaches—predictive and systemic—that can be used individually or in combination, depending on an agency’s needs. The Louisiana Department of Transportation and Development used data-driven systemic tools to strategically prioritize and implement 105 miles of cable median barriers on controlled-access facilities across the state. The agency plans to install another 180 miles. California used DDSA to predict that a roundabout in a high-speed corridor would achieve an 80- to 90-percent crash reduction. Once the roundabout was built, the corridor had a 100-percent reduction in fatal crashes and a 92-percent drop in injury crashes the three years after construction compared to the three years before. “Pretty much what we predicted,” said Jerry Champa, transportation engineer for the California Department of Transportation. California is expanding its use of data-driven approaches. “Data-driven safety analysis has become the vehicle to help us get safety integrated into all our other capital projects,” said Champa. The Minnesota Department of Transportation conducted a comprehensive systemic analysis of local roads to determine the highest-risk locations across the system. Counties then installed low-cost countermeasures at those sites. The result was wider, but more targeted, safety investment. Systemic analysis tools identify the highest-risk locations on a road network, enabling planners to better target low-cost countermeasures to more locations. “If we were to use a reactive-based, reconstruction-based methodology in our highway safety program, we would never be able to treat the entire at-risk highway system,” said Victor Lund, traffic engineer for St. Louis County, Minnesota. The New Jersey Department of Transportation, Delaware Valley Regional Planning Commission and Burlington County used predictive analysis tools to justify federal funding for a modern roundabout at a rural intersection. “When you have a data-driven analysis, it’s easier to demonstrate the need and to calculate the benefit. Data-driven analysis is a great way to establish your need and provide evidence that it’s a good investment,” said Kevin Murphy, assistant manager of safety programs for the Delaware Valley Regional Planning Commission. Predictive analysis tools helped the New Jersey Department of Transportation, Delaware Valley Regional Planning Commission and Burlington County decide to build a roundabout at a rural intersection. Watch a video that explains DDSA approaches and highlights state success stories. 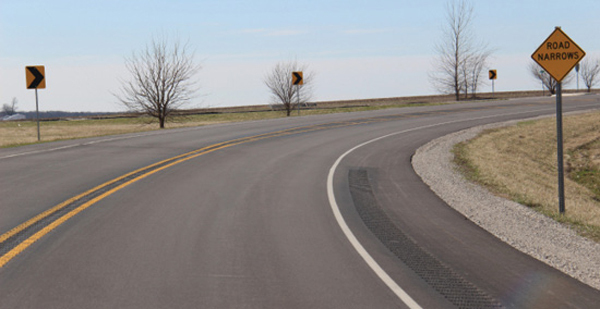 See the FHWA Roadway Safety Data Program Toolbox for resources to improve agency programs. Go to the Crash Modification Factors Clearinghouse for a database to help identify safety countermeasures. Get information and technical assistance from Jerry Roche of the FHWA Office of Safety and John McFadden of the FHWA Resource Center. Go to the American Association of State Highway and Transportation Officials Highway Safety Manual website for information on evaluating highway safety performance. See AASHTOWare Safety Analyst for software to determine sites with the highest potential for safety improvement. 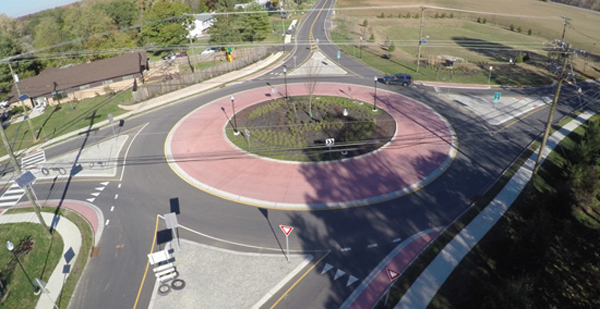 Video: Watch a video on how DDSA helped justify investment in a roundabout in New Jersey. See FHWA’s Interactive Highway Safety Design Model for software to evaluate the safety effects of geometric design decisions on highways. See FHWA’s Systemic Safety Project Selection Tool for a process for conducting a systemic safety analysis. Visit the U.S. Road Assessment Program website for software to generate a program of road network improvements. The national network of State Transportation Innovation Councils is “the single most important piece in creating an ongoing culture of innovation in the transportation industry,” says Federal Highway Administrator Gregory Nadeau. With the signing of a STIC charter in Hawaii, STICs are now active in all 50 states, Puerto Rico, the U.S. Virgin Islands, Washington, D.C., and Federal Lands Highway, Nadeau said during a national STIC web conference in June. The idea behind STICs is to enable transportation stakeholders to make innovation decisions that best fit each state’s unique needs. At the Delaware Department of Transportation, innovation is a “top-down, bottom-up mentality in every division,” Transportation Secretary Jennifer Cohan told STIC webcast participants. The department encourages an innovative culture through staff development, including an annual leadership academy with sessions taught by department and FHWA staff, contractors, state legislators and the governor. 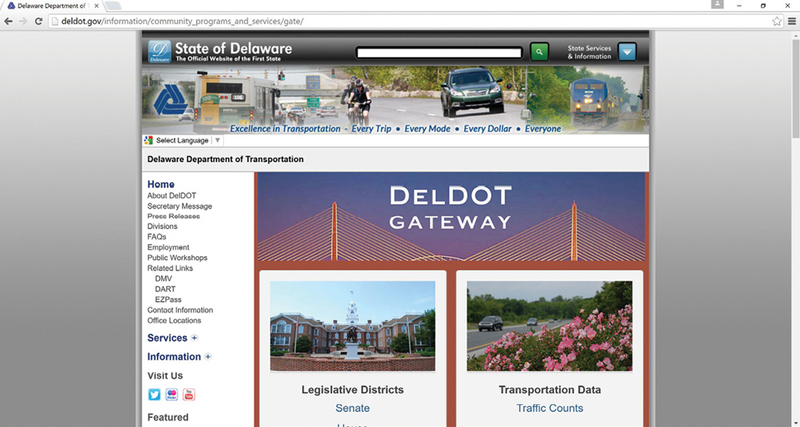 The agency enhances customer service through innovations such as DelDOT Gateway—an online source for details on pavement projects, bridges, traffic data and transit maps—and the DelDOT App—which provides travelers with real-time road information such as snowplow tracking. “We know customers are looking to us for information,” said Cohan, citing the jump in app downloads from 5,000 a day to 40,000 in one day during a blizzard last winter. 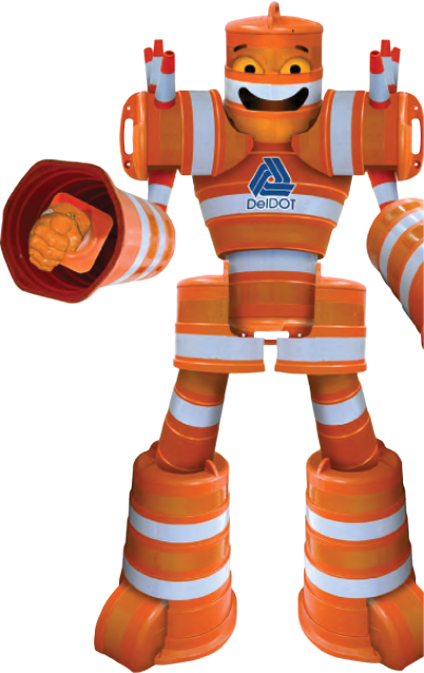 Creative outreach strategies include sending Wally the Work Zone Warrior, a mascot made of used traffic cones and barrels, to community events and parades to remind drivers to slow down around work sites. “This is an innovative way to market work zone safety, and I can tell you it really is working,” said Cohan. The Delaware DOT also implements new technologies and practices to deliver projects more efficiently, such as accelerated bridge construction, e-Construction and construction manager/general contractor project delivery. The department is building the state’s first diverging diamond interchange at Delaware Routes 1 and 72 in New Castle County to enhance safety and mobility while lowering project costs. It’s using design-build delivery on the project, which received an Accelerated Innovation Deployment Demonstration grant from FHWA. Internally, the department puts innovation at the forefront through its annual employee competition, Innovations Challenge, which culminates in a showcase of ideas in use in districts around the state. Since it began in 2007, the challenge has generated more than 1,000 innovations, more than 150 of which are now agency best practices. “It’s really not as much about the competition as getting employees to look around at the ideas, take them back to their divisions and figure out how to make them even better,” said Hassinger. Through its Road to Tomorrow initiative, the agency is making I-70 from Kansas City to St. Louis available to private industry to test various innovations through pilot projects. The focus is not only on innovations in traffic engineering, design and construction, but also on innovative ways to fund transportation infrastructure. After receiving 350 submissions, the agency announced plans in June for its first pilot projects. They include implementing smart highway technologies that feature information services funded by subscription, platooning truck traffic with wireless connectivity to enhance safety and fuel economy, and creating energy with roadway solar panels to melt snow and generate electricity. Transportation departments in 18 states and Washington, D.C., are using ultra-high performance concrete connections for prefabricated bridge elements on construction projects. In another three states, UHPC connections are a standard practice to improve durability and accelerate construction on bridge projects. Using UHPC, a steel fiber-reinforced material, to connect bridge elements is an innovation the Federal Highway Administration began promoting in 2015 in the third round of the Every Day Counts initiative. UHPC connections for prefabricated bridge elements will continue as an EDC-4 innovation in 2017 and 2018. UHPC can achieve more efficient development of the reinforcing steel used to connect prefabricated concrete elements, Leonard said. And it’s more resistant to freeze-thaw damage, abrasion and chloride penetration than conventional concrete. When calcium chloride is used as a deicer, it can penetrate concrete and cause the reinforcing steel to deteriorate. An example of the benefits UHPC provides is the reconstruction of the deck of the Franklin Avenue Bridge in Minneapolis, Minnesota. Crews redecked this open spandrel arch bridge over the Mississippi River during a 90-day closure over the summer. The project is a perfect example of the use of accelerated bridge construction technologies, including prefabricated bridge deck panels and UHPC connections, to deliver a robust bridge deck with reduced impact on the traveling public, according to Dr. Benjamin Graybeal, FHWA Bridge Engineering Research Team leader. After trying UHPC on several demonstration projects, the New Jersey Department of Transportation adopted the routine use of UHPC on closure pours. The agency used UHPC on deck replacements on the Pulaski Skyway rehabilitation project and on the Route 46 bridge over the Musconetcong River bridge project. UHPC has been used on seven bridge projects in Iowa since 2006. A prefabricated bridge using UHPC connections was completed on the Iowa 92 over the Little Silver Creek project in Pottawatomie County. During a full road closure in fall 2015, crews demolished the existing bridge and moved the superstructure modules into place. They connected the modules with narrow longitudinal joints filled with UHPC and joined the superstructure system to the substructure with UHPC transverse closure pours. Connections of prefabricated bridge elements using UHPC are similar to those using conventional concrete, but shorter development lengths of reinforcing steel are used. That allows simpler reinforcing steel details and smaller areas for the connections. With shorter development lengths, less steel is needed in the connection. Large amounts of steel in the connection area can interfere with prefabricated member placement and placement of concrete in the connection. View the EDC Ultra-High Performance Concrete Connections presentation for an overview of UHPC in bridge construction. Read the FHWA TechNote on Design and Construction of Field-Cast UHPC Connections for guidance on deploying UHPC connections. For technical assistance and training on using UHPC connections, contact Mark Leonard, structural engineer at the FHWA Resource Center. Buchanan County, Iowa, recently deployed the nation’s first ultra-high performance concrete overlay on a deteriorated bridge deck. The 1.5-inch-thick overlay was installed in two 14-foot wide passes across the bridge, a three-span continuously reinforced concrete slab structure across Mud Creek on County Road L.
“The advanced mechanical and durability properties of UHPC can result in the deployment of an exceptionally robust structural overlay,” said Dr. Benjamin Graybeal, FHWA Bridge Engineering Research Team leader. Graybeal visited the project site to provide technical assistance and help deliver a UHPC connections workshop to Iowa Department of Transportation, county government and private sector participants. The Buchanan County project used a commonly available UHPC product, Graybeal said. The new deck was ground and then grooved to provide the appropriate surface characteristics, including rideability and surface texture. New funding is available from the Federal Highway Administration’s Accelerated Innovation Deployment Demonstration program to encourage the transportation community to adopt proven innovations. Funding for the AID Demonstration program, launched in 2014 as part of the Moving Ahead for Progress in the 21st Century Act, was continued by the 2015 Fixing America’s Surface Transportation Act. Since AID Demonstration was introduced, FHWA has provided more than $43 million for 61 awards. “Through the FAST Act, FHWA expects to make about $10 million available for AID Demonstration projects in each fiscal year from 2016 to 2020,” said Thomas Harman, director of the FHWA Center for Accelerating Innovation, which administers the program. The purpose of the AID Demonstration program is to provide incentives to accelerate the implementation and adoption of proven innovations in highway transportation. Under the program, funding of up to $1 million may be awarded for projects that use proven innovations in any project phase, including planning, financing, operation, structures, materials, pavements, environment and construction. Applications are accepted on a rolling basis through Grants.gov, the federal government’s website for information on funding opportunities. There are no deadlines for applying. State transportation agencies, federal land management agencies and tribal governments are eligible to apply for AID Demonstration funds. Metropolitan planning organizations and local governments can participate by applying for grants through state transportation agencies. AID Demonstration fund recipients develop performance goals for their project and work with FHWA on a plan to collect information on project performance. Recipients produce project reports that document the process, benefits and lessons learned, as well as any guidance, specifications or tools they develop to support rapid adoption of the innovations as standard practice. For more information on the AID Demonstration program, contact Ewa Flom, program manager at the Center for Accelerating Innovation. The Federal Highway Administration, in cooperation with the Gwichyaa Zhee Gwich’in tribal nation, is building Alaska’s first geosynthetic reinforced soil-integrated bridge system project. The project to replace a bridge over the Sucker River in Fort Yukon, 11 miles north of the Arctic Circle, will test GRS-IBS technology in a harsh environment with record temperatures of 100 F and minus 78 F. The project will improve access for area residents. State transportation agencies in Maine, New Hampshire and Vermont launched a regional advanced traveler information system called New England Compass. It combines data from dispatchers, sensors, weather stations and traffic cameras to provide travelers with real-time information and road conditions. FHWA provided an Accelerated Innovation Deployment Demonstration grant for the project. The Catwalk National Recreation Trail in New Mexico’s Gila National Forest reopened to visitors in time for the 2016 summer season. Design-build project delivery helped accelerate reconstruction of the pedestrian catwalk, damaged in 2013 flooding. The recreation area draws thousands of visitors annually and is an important economic generator for nearby communities. The project received funds from the Emergency Relief for Federally Owned Roads program. The North Dakota Department of Transportation and FHWA executed a programmatic agreement for categorical exclusions to help streamline the environmental review process on Federal-Aid Highway Program projects. The agreement enables the North Dakota DOT to determine whether a project qualifies for categorical exclusions, actions that don’t involve significant environmental impacts. The agreement will expedite project delivery while maintaining accuracy in the environmental documentation and approval process. The Ohio Department of Transportation held a “topping out” ceremony this summer to celebrate the placement of the final large steel beam on the second new George V. Voinovich Bridge on I-90 in Cleveland. Crews used a crane to raise the steel beam—96 feet long and 112,475 pounds—over Abbey Avenue. The bridge, being delivered with the design-build technique, is scheduled to open to traffic this fall. The project is part of an effort to improve safety, reduce congestion and modernize interstate travel through downtown Cleveland. The Pennsylvania State Transportation Innovation Council held an Innovation Day to highlight innovation’s role in delivering a high-quality transportation system. More than 200 people learned about the state’s use of solutions such as accelerated bridge construction and adaptive signal control technology. “Pennsylvania is a national leader in deploying innovations which are proven to streamline environmental review and reduce impacts, decrease construction time, reduce delays to the traveling public and make work zones smarter and safer,” Pennsylvania Transportation Secretary Leslie Richards said.